This week we saw Al Jazeera journalist, Mr Peter Greste walk free from a seven-year jail sentence in Egypt. Mr Greste was found guilty based on evidence that he had in his possession, namely video footage, supporting the blacklisted Muslim Brotherhood but his lawyers have said there was absolutely no substance to the allegations. During his 400 days in prison, he maintained his innocence and was able to manage his expectations well throughout the process with the support of his family. It was during his press conference in Brisbane we all witnessed that love and support as his family sat by him while he delivered his sincere and very poignant address to his fellow members of the media. Without a doubt, Mr Greste nailed the press conference. He began by genuinely thanking his family, this was heartfelt and meaningful and certainly came across on camera. Mr Greste tells a story, it is vivid and personal. His experience draws you in – this is a great technique to use when dealing with the media. He also names the campaign his family, along with the media, embarked on in order to release him – Journalism is not a crime #FreeAJstaff. He links the campaign to his social media sites – a clever call to action. What are your thoughts on his press conference? We often hear from clients about their brilliant, show-stopping press releases yet they are baffled when they get no bites from busy journalists. Try these helpful hints when structuring your next press release. Make sure in your pre-writing thinking you consider the angle of the story. Is the news interesting? Will anyone outside of your organisation care? Make sure you keep to the facts; what does your product, service or event have to offer readers. Create interest in the headline and be direct. Make sure your release has a purpose. Keep in mind that your goal is to make journalists want to pick up the phone or send an email to find out more. Is your news timely? Or has it passed its use-by-date? With online news sites giving readers up-to-the-minute news updates your release needs to be factual and informative. Make sure you don’t leave out useful information making your release newsworthy. Keep in mind the purpose of a press release – you’ve got news to share and a strong, descriptive quote will capture the attention of journalists. A quote also provides the journalist with name of your spokesperson and who they could potentially interview. Lastly, make sure you do more than just email your press release to media contacts. Use your website to promote your news, preferably with a link on your home page. Not only are you adding fresh content to your site, search engines will love it. In our media training workshops, we will often get through an entire practice interview without a single mention of the organisation, or product the interviewee is there to talk about. When you have questions being fired at you it’s easy to forget exactly why you are there. Even more surprising are the number of people we’ve worked with who have struggled to articulate exactly what their organisation does! So how do you ensure your brand message comes through? Here are some tips to help with your interview preparation. Who you are may relate to your vision and mission. Who do you want to be and how do you plan to leave your mark? These messages embody the core of your being, your values, and your competitive advantages. In basic terms, clearly and succinctly articulate what product or service you offer or provide to your clients. This isn’t a sales pitch so stick to the facts. What benefit do you bring to the audience? Tell it as if someone else, an objective third party, was sharing it with a friend or colleague. It’s easier to trust that third-party voice, and it’s the same voice journalists write in, so it may help your story get picked up if your message is well-crafted. What evidence do you have to support your position? This could be in the form of awards, recognition or testimonials from your best clients. Anything you can offer to validate your claims will enhance your credibility. Once you have the messaging developed, it becomes your bible to inform and influence all content development, from your website to a media kit and the boilerplate of press releases. It will also play into advertising content, if you place paid media. So now there’s a consistent voice across all platforms: earned (editorial), owned (website and social media) and paid (advertising). Media training is so much more than just being “camera ready” with key messages prepared. Media training should delve deeper to ensure an organisation has recognised potential risks (commonly referred to as an issues audit) and then developed a media plan which will set out exactly what staff should do in the event of an organisational crisis. A crisis, well handled, doesn’t have to escalate to the point of becoming a public relations disaster. Being prepared with a list of possible scenarios and potential incidents will help manage sensitive or emerging issues in the media. Below is a list of the steps involved in preparing a comprehensive and concise issues and crisis media management plan. what is the impact? What is the level of risk? what is your media response. 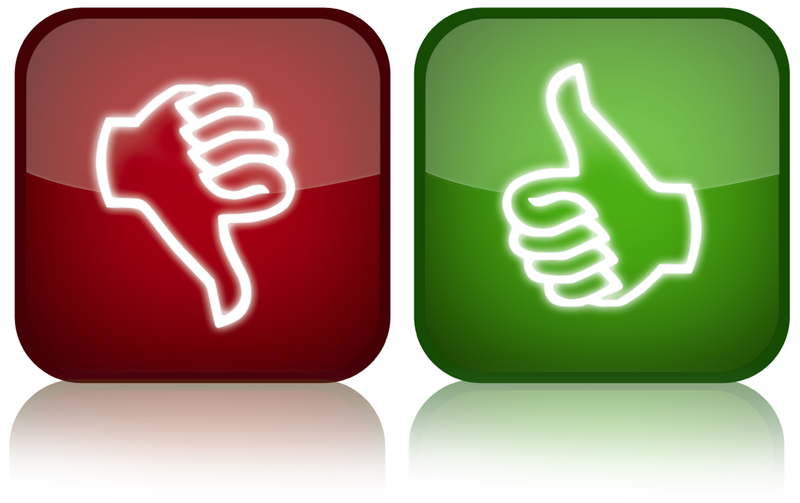 Make sure the appropriate people have agreed with the media strategy and the media responses are approved. Having prepared this plan in advance will ensure a speedy and coordinated response time should any issue or incident occur. 7 reasons avoiding social media hurts your brand. Is your organisation still avoiding social media in the fear it could become another forum for complaints and further stretch your customer service team? It’s true having an organisational Facebook page, for example, will mean assigning at least one person to managing the feedback on that page. In our experience, people complain on social media when they’ve had no satisfaction from other avenues. However, not having an official Facebook page or Twitter account doesn’t mean you’re not being discussed on social media. 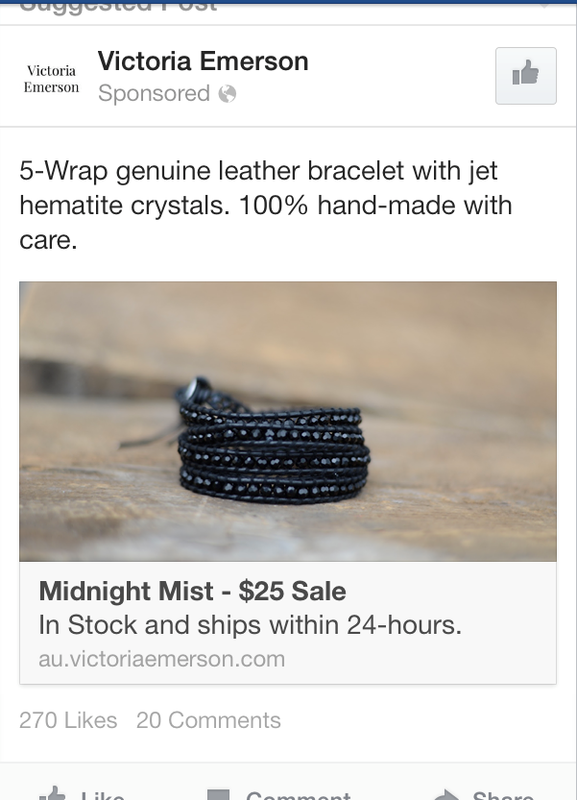 It’s just happening on your customers’ pages, their friends’ pages and possibly your competitors’ pages too. (The average Australian Facebook user has 338 friends, by the way, so bad news truly does travel fast these days.) Not being privy to these conversations means you’ll never have the opportunity to address the complaint or influence community perceptions. Many leading brands now accept social media community management as an integral part of customer service: a mandatory price of doing business. 2. Social media participation shows you’re listening to your customers which, according to the Edelman Trust Barometer, is the most important driver of trust in a business. It’s also where most organisations, including those in the public sector, fall down in earning consumer trust. More than 81 percent of Twitter users expect a same-day response to questions and complaints, according to an Oracle survey. 3. Listening gives you instant qualitative feedback, allowing smart businesses to improve their product and/or their messaging and promotions. 4. Social media provides a one-to-many platform when you need it most. When a Southwest Airlines Flight 345 experienced equipment failure and an uncontrolled landing at LaGuardia Airport on July 23, 2013, 10 passengers were hurt. Within 30 minutes the airline had deployed a social media strategy, updating the public and creating an official hashtag to aggregate information. Service failure for your business might not be life threatening, but leading the conversation and managing customer expectations helps stop an issue from developing into a brand-damaging crisis. 5. The best place to address an attack is on the medium where it first appears. If a dissatisfied customer or a disgruntled employee disparages your business on social media, that’s where the market (and journalists) will be watching for your response. Sure, you can always quickly create an account if it hits the fan, but is that really when you want to be dipping your toes into social for the first time? 7. If you don’t claim your identity, someone else will. Ikea, Starbucks, Apple and Jetstar Australia are just some of the brands that have been impersonated in social media with potentially disastrous results. In all cases they had official accounts that gave them a platform and an established audience to expose the “imposter pages” and manage the situation. Anyone could create a Facebook page or Twitter account in your businesses’ name, but if you’ve already staked your claim and established a following, they’re less likely to cause confusion or damage. You can also apply to Twitter and Facebook to have your account “verified”, to further protect your brand. http://mediafriendly.com.au/wp-content/uploads/2016/03/Media-Friendly-Logo-web-300x138.jpg 0 0 Main_User_3 http://mediafriendly.com.au/wp-content/uploads/2016/03/Media-Friendly-Logo-web-300x138.jpg Main_User_32014-08-27 02:27:432016-03-23 03:30:147 reasons avoiding social media hurts your brand. 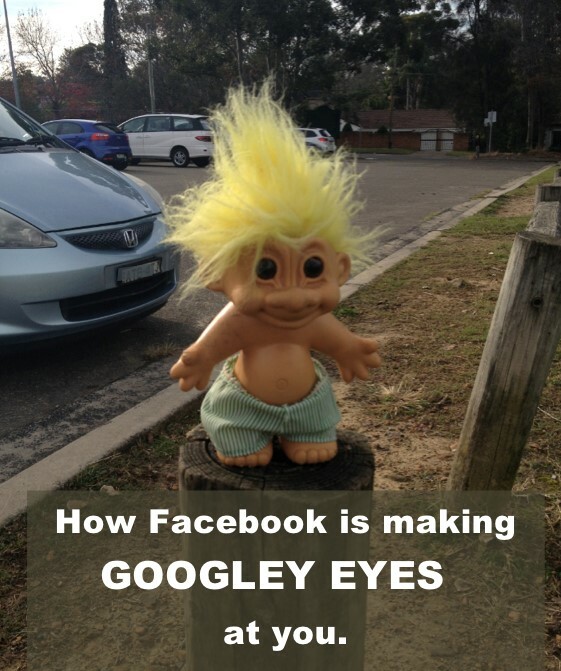 How Facebook is making Googley eyes at you. But yesterday I realised Facebook now knows what I’m doing OUTSIDE of their pages. And it’s not. Facebook is now targeting your web-browser and using information about what you search and view outside of Facebook, to inform what you see INSIDE of Facebook. Predictably and innocuously they call it “Making Ads Better and Giving People More Control Over The Ads They See”. The rest of the world calls it Online Behavioral Advertising and you can opt out of it here. I’m very conflicted about all this. On one hand it’s a little creepy to know Facebook is making Googley eyes at me and my family every time we check out a website. On the other hand, as a marketer who pays for Facebook’s ability to find my audience, I can see how it will make reach and engagement potentially so much better. If your business sells products to new homeowners for example, you can now target them based on the real estate, removalist and locksmith websites they’re viewing. You’ll know exactly what they’re interested in and how you can help. In view of the recent complaints that Facebook is no longer a free business tool, features like this can remove the guesswork and substantially improve your ROI. I’d be willing to bet most marketers would pay for that. http://mediafriendly.com.au/wp-content/uploads/2016/03/Media-Friendly-Logo-web-300x138.jpg 0 0 Main_User_3 http://mediafriendly.com.au/wp-content/uploads/2016/03/Media-Friendly-Logo-web-300x138.jpg Main_User_32014-06-16 20:00:582014-06-16 20:00:58How Facebook is making Googley eyes at you. Everyone kicks an “own goal” sometimes. 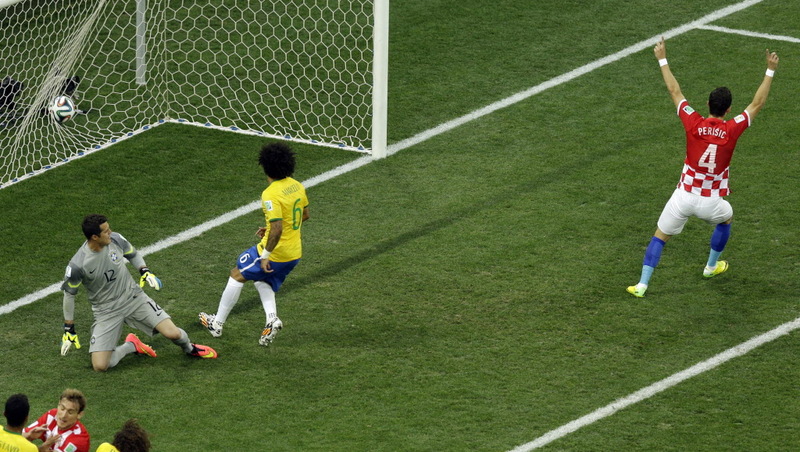 As far as public humiliation goes, Brazilian footballer, Marcelo kicking the first goal of the first game of the 2014 Brazil World Cup – straight into his own team’s net – would have to be hard to trump. When the stakes are high and, thanks to technology, instantly visible worldwide, things can and do go wrong. But it’s what you do next that determines whether you take a hit, or take it in your stride. Whether it’s on the sports field, midway through a TV interview or in front of a million followers on Twitter, recovering and staying focussed on the big picture is the only way out. As Winston Churchill so famously said, “If you’re going through hell, keep going”. Which Brazil did, beating Croatia 3 – 1.
http://mediafriendly.com.au/wp-content/uploads/2016/03/Media-Friendly-Logo-web-300x138.jpg 0 0 Main_User_3 http://mediafriendly.com.au/wp-content/uploads/2016/03/Media-Friendly-Logo-web-300x138.jpg Main_User_32014-06-13 09:38:582014-06-13 09:38:58Everyone kicks an "own goal" sometimes. Grammar? Spelling? Wot u talkin bout? Take you back to your childhood and Sesame Street? Share it around – hopefully some of these very simple lessons might even catch on! http://mediafriendly.com.au/wp-content/uploads/2016/03/Media-Friendly-Logo-web-300x138.jpg 0 0 Main_User_3 http://mediafriendly.com.au/wp-content/uploads/2016/03/Media-Friendly-Logo-web-300x138.jpg Main_User_32014-05-15 03:43:472014-05-15 03:43:47Grammar? Spelling? Wot u talkin bout? Geoff Huegill apology all a bit wrong …..
As we all know an apology is about so much more than the word ‘sorry’. It’s about tone of voice. It’s about body language. Does the person offering the apology look and sound sorry? When Geoff Huegill faced the media pack camped outside his home recently to apologise over his arrest for alleged drug possession, one can only imagine how uncomfortable and nervous he must have been. It was a brave thing to do. But … watching his apology on the 6pm news I was struck both by the language he used and the smirk on his face. He described the episode as a ”commotion” and then smiled directly into camera as he delivered his “I’m sorry” speech. Body language and tone of voice MUST match the words you say – otherwise your audience just won’t buy the message. Here’s hoping Geoff takes a big dose of humility before his court appearance in a few weeks. I actually have no doubt he really is sorry. He shouldn’t be afraid to show that. As for the big, black get away car …. it might be a good idea to trade it in for something more discreet and inconspicuous. A humble Mazda would do the trick. Here are a couple of great keynote speeches you might like to watch for inspiration. 1. Think about your audience. Your presentation should be about ‘them’ not you. 2. Your objective. Are you planning to educate, entertain, persuade, inspire … ? 3. Be authentic. Don’t try to channel Ellen or Tim or even Bill Gates. It won’t work! Be yourself. 4. Spend time rehearsing. Say it out loud. Punctuate your presentation with deliberate pauses. Be descriptive and use metaphors and analogies to colour your speech. 5. Enjoy it. There is nothing more off putting for an audience than watching someone who is clearly uncomfortable and can’t wait to get their presentation over with.